It is the year of our Lord 1519 and Hernando Cortes is preparing to sail from Cuba to the New Lands in what will become known as Mexico, to conquer the people and claim the land in the name of God and the King of Spain. Meanwhile, in the city of Tenochtitlan, the Great Speaker (Priest) Moctezuma is sacrificing hundreds of slaves in the hope of pleasing the War God, Hummingbird. Two women - from very different backgrounds - are being prepared for sacrifice and rival tribes are preparing for an assault on the city in an attempt to stop Moctezuma from winning the favour of Hummingbird. In a twist of fate, the girls are released and hear of the invasion. They believe the men from across the sea are heralding a new age of peace and they begin the dangerous task of destroying Moctezuma and his hold over the people of Mexica. One thing I love about historical fiction and those who write novels set in the past, is discovering how another person interprets those times and weaves a fictional story into and around a skeleton of fact. Writing about events that have been well documented is a difficult undertaking. Because of the wealth of information available, it is sometimes impossible to find a "way in", to find a place where you can start and develop a story. However Graham Hancock has, once again, produced a book that entertains as well as educates. Many of us will have a basic understanding of the Spanish Conquest of the South American continent but the true scale and brutality of the invasion, as described in War God is likely to shock. Not only the violent methods inflicted by the Spaniards on the natives, but the way the indigenous population waged war on each other and corralled their prisoners before sacrificing them on the steps of their Pyramids and feasting on their remains. 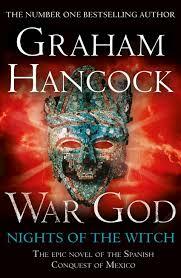 War God is a rich and deeply involving novel that grips you from the very first page. If you can handle the gruesome detail, then you will devour every page and the end will come too soon, leaving you desperate for book two, The Return of the Plumed Serpent. I give "War God: Nights of the Witch" 4 Crosses! BUY WAR GOD FROM MY AMAZON STORE! Great review! I am always fascinated with how an Author can take a historical story and make a novel. Thank you for sharing! I haven't read this book yet but I'm going to have a look. There's been a lot of interest in the encounter between European and native American cultures in North America; but we don't hear anywhere near so much about happened elsewhere on the American continents. Yet the history of the southern Americas is vast and colourful. So its good to see a novel set in this world which engages with it.